Amy Farley has had a varied and accomplished running life: from the track as a kid, down the roads of Austin, through the streets of Boston, to the rims of the Grand Canyon. An “almost original” Gazelle (she hitched her wagon to the group in 2004, two years after its official launch), Amy has been an enduring, supportive, and, of course, joyful, presence in the herd. So Amy kept running and kept having fun. She toed the line again at the Austin Marathon in 2012 and ran what she considers her best race ever—which also happened to be her first Boston Marathon Qualifying Time (BQ). “I’m proudest of my first BQ,” she readily admits. “It wasn’t my fastest race but it was my most solid race. I stuck to the plan and trusted in the pace. There was never a time when I thought I wouldn’t make it. It had been a really fun training season. I had good friends pedaling all over the course cheering for me, Yetik Serbest pacing me, and Peter Flemings ran me in.” The combination of good training and good friends yielded a perfect day. 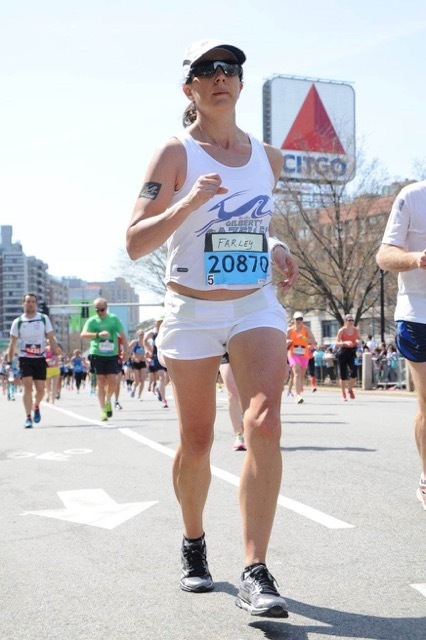 That 2012 BQ led to Amy’s first Boston Marathon in 2013. 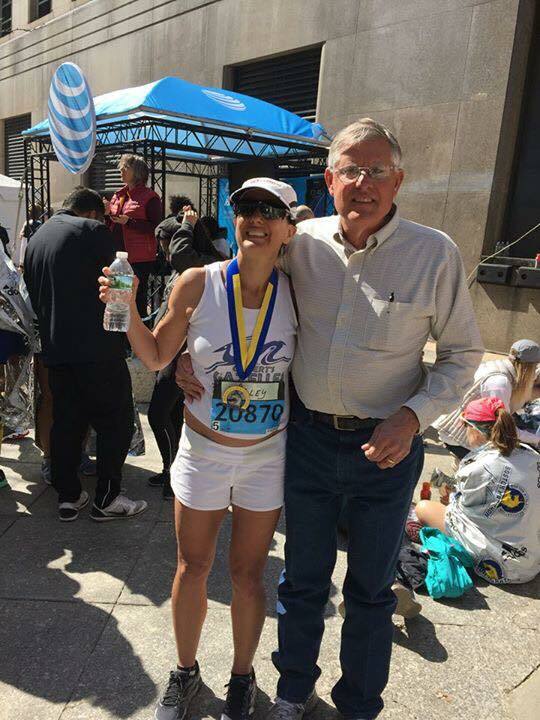 “My Dad has come to Boston every year I’ve run it, including 2013, the year of the bombings,” she said. “The first thing he asked afterward was, ‘You are coming back next year, right?’ He was ready. 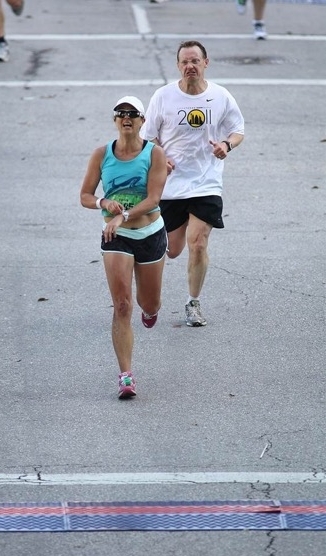 No fear.” Amy returned to the Boston Marathon in 2014 and again in 2016. Amy trains on Tuesday-Thursday at 5:30am and is quick to help a friend on a run or offer a hug in the sleepy predawn Saturday darkness. She hosted the Gazelle Austin Marathon cheer station near her house before the course change in 2018. Part of the fabric of Gazelles, Amy is an integral part of the vibe that makes the group so special. Working as a software developer and going to graduate school in geographic information systems leaves less time this year for a full race schedule. However, she still completed the 47-mile Rim to Rim to Rim trail run in the Grand Canyon in May with a group of Gazelles. <ED: add hot link to GC post here> “I was nervous for three days before,” she admits. “It was the most epic thing I’ve ever done. I had been to the Grand Canyon, so I knew it was hard. And the training in Austin was tedious. We would do the 3-mile section of the River Place nature trail. The longest day out there was 6 hours, around 18 miles. 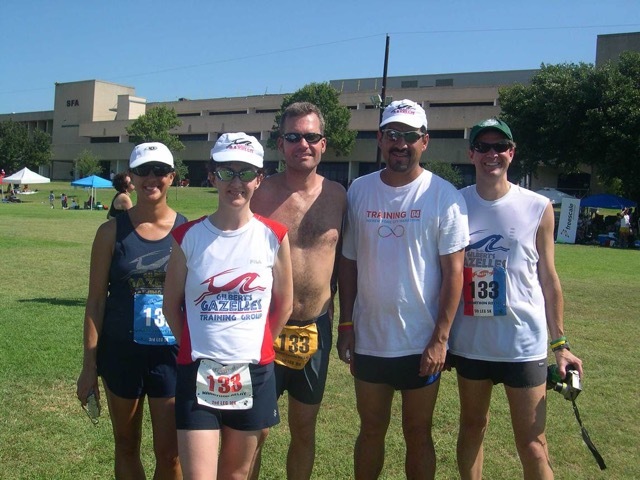 Just out and back, out and back, out and back.” She also ran a speedy Houston Half Marathon in October, and a week later ran her favorite race, Run for the Water, as a “fun run” to support Gilbert and the Gazelle Foundation. So keep an eye out for Amy and her trademark hat and sunglasses. We’ll be waiting to see where life takes her next. Lots of former Gazelles and Jay Clement is in there too. These are my ALL.TIME.FAVORITE race photos. That is Peter Flemings behind me. He actually ran me in the last two miles, and that’s him encouraging me (not about to attack me) because I finally got my first Boston Qualifying time after Yetik Serbest paced me until ~Mile 24 and Peter ran with me to the finish.